It is delivering drain survey and cleaning services as part of a multi-million-pound plan to redevelop and restore The Crescent, a Grade 1 Listed Georgian building in the town. 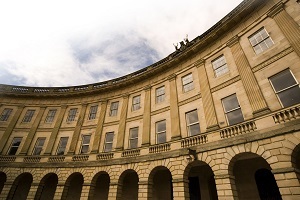 The aim of the investment is to put Buxton back on the national and international tourist map by promoting its heritage as a world-famous spa town. VINCI Construction UK has commissioned Lanes, the UK's largest independent drainage specialist, to provide drainage services for the scheme. Ian Clapham, Area Development for the Lanes Manchester depot, said: "We are very pleased to be able to support such an important project for both Buxton and the region's tourist economy. "This is a highly complex project, which involves our teams being called on to work flexibly efficiently alongside VINCI and their many other contractors. "Thankfully we have the capacity and know-how to do this, as well as the expertise needed to work on drainage systems associated with important historical buildings." When complete, in 2019, The Crescent will have an 80-bedroom five-star spa hotel, which will incorporate the magnificent Assembly Rooms and a thermal natural mineral water spa in the Natural Baths. There will also be six new shops. The project is creating 350 construction jobs, plus more than 140 permanent jobs directly, and many more indirectly, resulting in a predicted £4.5million boost to the local economy. The Lanes drainage teams need to know their way around drains and sewers installed, repaired, adapted, and added to over more than 200 years, in most cases without leaving any useful records. A jet vac tanker has been deployed to clean drainage lines while a CCTV camera team has been carrying out drainage surveys and mapping the underground pipe systems. Ian Clapham said: "It's important that civil and structural engineers know the location, type, and condition of pipes so they can draw up the best plans and guide construction teams. "As new drainage lines are installed, where they are needed, we can also clean and survey those, so both VINCI and its client can be confident they are connected properly and fit for purpose." The Crescent was the centrepiece of the Fifth Duke of Devonshire's plans to establish a fashionable Georgian spa town in Buxton. It was designed by architect John Carr and built between 1780 and 1789. The building was inspired by the Royal Crescent in Bath but has been described by The Royal Institute of British Architects as being more richly decorated and more complex.